Are you interested in creating a simple and unique way to advertise your website? 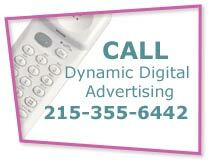 At Dynamic Digital Advertising (DDA), we have a variety of solutions to fit your needs. With pay-per-click advertising available on the major search engines like Google and Yahoo! you can bid your website to reach the front pages of search engines when users search for a keyword related to your site. Recently, Google has released the click-to-pay video advertising to allow you to show a short video clip to help promote your website from the pay-per-click advertisement. DDA also has the unique ability to create compelling video with a complete in-house video production team that can handle everything from pre-production to post-production services, including the new click-to-pay video ads. So now you can advertise your website in style using a video spokesperson to describe the many benefits and highlights of your company and the website you hope to attract users to. With a simple pay-per-click ad campaign, users can see the benefits of your company with their own eyes – before they even get to your website. With an effective spokesperson video in place, you can easily promote the features of your website. Whether you promote a new product or service, a new medical device, or just want to showcase some of your inventory, then a spokesperson video is right for you. With the pay-per-click marketing program, your simple video will be seen on the front pages of the largest search engine on the Internet – there is no better publicity than that. Compared to the text links and advertising, your spokesperson video will stand out above the rest to lead searchers directly to your website. Furthermore, the front page of your website can be customized with its own spokesperson to point out the specific areas of the website you think users should visit. DDA’s in-house video production team is ready to create any promotional piece you need. If a spokesperson video is not for you, then also check out the new product advertisement, medical device advertisement, and product showcase advertisement sections to see how DDA’s pay-per-click management system can benefit you.